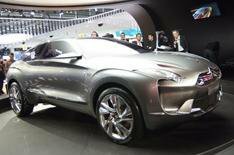 Citroen Hypnos | What Car? This is the Citroen Hypnos concept car, which could form the basis for a crossover-car based around the C5 as early as next year. It has a hybrid drivetrain that Citroen is calling Hymotion, which uses a diesel engine to power the front wheels and an electric motor to drive the rears, giving four-wheel drive. Coupled with the electric motor, the 200bhp engine returns 62.7mpg and emits 120g/km of CO2. While the exterior styling is expected to make production, the interior, which features coloured lighting to appeal to different moods, is not. We've seen the C-Cactus concept car before its an environmental concept car that achieves low emissions through being ultra-lightweight. To this end, the cabin uses just 200 parts almost half of the number in a standard production car. Here in Paris Citroen has unveiled an electric version of the car, which has a top speed of 70mph and range of around 100 miles. Future versions of the C-Cactus under development include a petrol-powered car using a 1.0-litre engine and a hybrid version using an engine and electric motor. There's also a C3 Pluriel Charleston in Paris, paying homage to the famous 2CV, which is celebrating its 60th anniversary this year. It features a two-tone colour scheme of black and red, and premium touches such as leather upholstery, 15-inch aluminium wheels and chrome trim fittings. It should go on sale early in 2010 from around 15,000, which is considerably less than you're likely to have to pay for the original 2CV that has been tarted up by fashion label Hermes for display here.